What? Is this real? How, Sway? 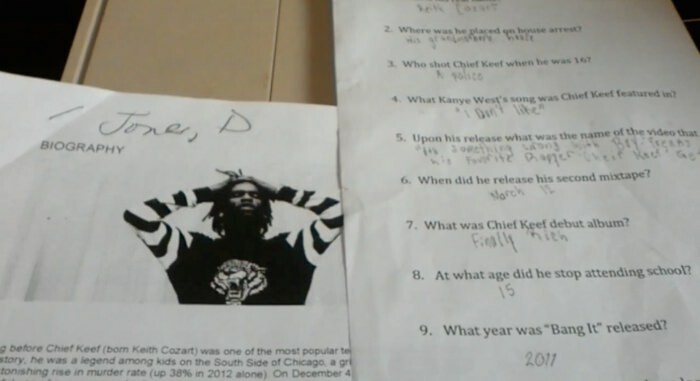 The Sun-Times & DNA Info are reporting that a substitute teacher at Fiske Elementary School on Chicago’s Southside is in hot water for giving students a Chief Keef quiz. Yes, you read that correctly. I remember studying Mozart, but in 2015 they study Cozart. Welcome to the future. Where was he placed on house arrest? Who shot Chief Keef when he was 16? What Kanye West song was Chief Keef featured on? At what age did he stop attending school? What was Chief Keef debut album? What year was “Bang” release? Sanders said Daniel came home with questions about the Illuminati and was nervous and scared about the material, which she said included handouts with profanity. The parents are understandably pissed and have taken to the press to lash out. You can read more about it right here.